The USSR invaded Poland on the east on September 17, 1939. On September 22, Germans and Soviets were in the Polish town Brześć Litewski (today Brest-Litovsk, in Belarus). The commander of the German forces was General Heinz Guderian, then to the control of the XIX Corps of Armies. He had been the one who had conquered Brest after a hard resistance of the Polish garrison that defended the castle of that city. The Soviet column was headed by Russian General Semyon Krivoshein, at the head of his 29th Light Tank Brigade. After the meeting, Krivoshein invited Guderian and the other German commanders to his tent, where they toasted his victory over Poland. Speaking fluently in French, the Soviet general apologized to the German commanders for not having invited any ladies to the event, and invited them to visit Moscow after what he wished for a quick victory over capitalist England (a victory that was not possible, largely thanks to Polish pilots who came to Britain and joined the RAF in defending the island during the Battle of Britain). That same day, Germans and Soviets made a joint parade in Brest to celebrate their victory. In April 1945, the Third Reich was on its last legs. Triumphant armies from multiple countries were advancing on German soil from all directions. Among the proudest were none other than the troops of the Soviet Union as they captured Adolf Hitler’s lair, Berlin. Nearly four years earlier, in 1941, the Führer had launched an invasion of the USSR in an attempt to exterminate its people and plunder its territory. Twenty-six million Russians and victims of other Soviet ethnicities did not survive. But beyond the sheer human cost of what many former Soviet states now remember as the Great Patriotic War, a less-than-heroic story provides sobering context for the most brutal military campaign of World War II. This epic of national survival celebrated in Russia and other countries every May 9 overshadows—but does not erase—a base exercise in communist aggression, atrocity, and betrayal. In the years immediately preceding the war, Hitler’s coercive diplomacy had absorbed Austria into the Nazi Reich and split Czechoslovakia into a Nazi-controlled Czech protectorate and a fascist Slovak puppet state. Poland was next, and Soviet dictator Josef Stalin had agreed to take part. 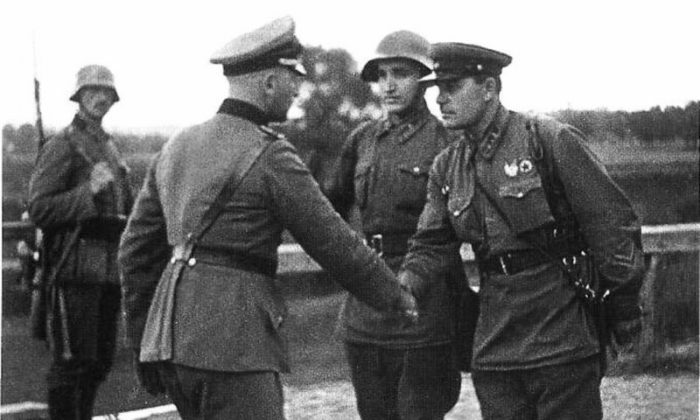 Days before German tanks blitzed Poland from the west, Stalin’s foreign minister, Vyacheslav Molotov, had signed a secret treaty with his Nazi counterpart, Joachim von Ribbentrop. On Sept. 1, 1939, Germany launched Case White—its name for the invasion of Poland. Seventeen days later, the Soviets attacked from the east. The USSR not only joined the German invasion of Poland but also supplied the Reich with crucial shipments of vital petroleum and other materials as Nazi tanks swept through the Low Countries and France—and as Wehrmacht divisions occupied the Balkans and North Africa. At the same time, Soviet troops annexed or attacked five other sovereign countries: Lithuania, Latvia, Estonia, Finland, and Romania. Much of Hitler’s initial success was Stalin’s own doing. By the time of the Nazi invasion of the Soviet Union on June 22, 1941, the Soviet secret police had been hard at work persecuting the millions of people living in its new territories. In particular, hundreds of thousands of Poles—mainly military personnel, clergymen, and public administrators—were murdered by the Soviet regime, adding to the millions of Poles who died in the war. In 1941, the Soviet Union was compelled to cooperate with the Allied powers after the Nazi empire it had mistakenly aided revealed its true colors. With generous resources from the West, the Red Army not only bore the brunt of fighting against the German military, but proved capable of mounting the massive tank campaigns that propelled it to Berlin—and allowed Stalin to subjugate the peoples of Eastern Europe under their own Soviet-style regimes. The Soviet people themselves suffered dearly as a direct result of, first, their rulers’ opportunism, and then the senselessly brutal measures with which the Communist Party and Red Army drove them to a bittersweet victory. Much of Hitler’s initial success was Stalin’s own doing. Starting in 1937, the Soviet Red Army was crippled by a mass purge of higher officers whom Stalin suspected of being disloyal. Dozens of generals, including those working on advanced variations of the German blitzkrieg strategy, were tortured and shot. Others, such as the famed Marshal Gregory Zhukov, were made to serve minor roles while Stalin’s yes-men filled the top positions. This created a nightmare for Soviet armies stationed in dense formation at the border in 1941—and the tens of millions of civilians in Hitler’s path. 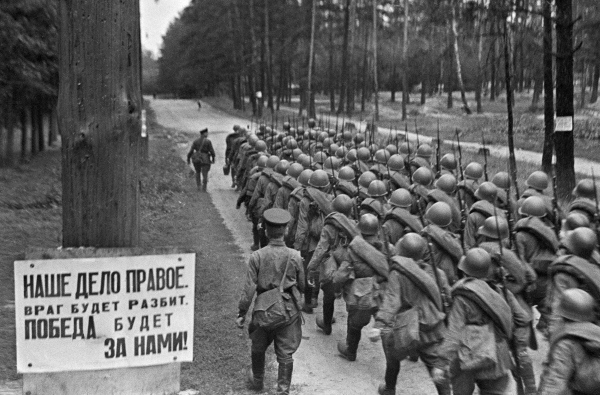 The Wehrmacht cut through the poorly led and unprepared Red Army with ease; German troops took several million prisoners in the opening weeks of the war. The vast majority ended up in Nazi death camps, where they were worked to death or shot by the thousands. After Jews, Soviet prisoners make up the second biggest group of Holocaust victims. Nazi brutality was matched and sometimes surpassed by the callous disregard Soviet commanders had for their own men. 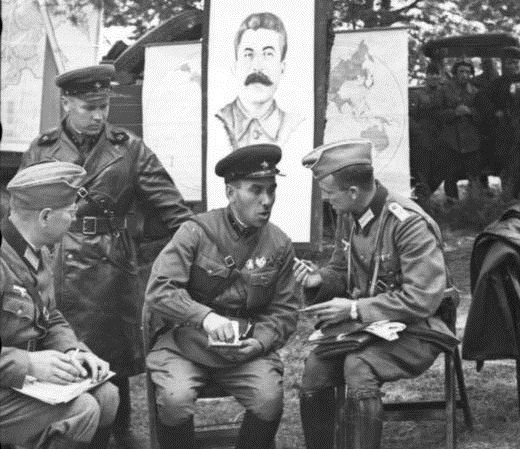 Instead of making strategic retreats to conserve manpower, Stalin and his officers gave the infamous Order 227—a short decree that forbade retreat even to avoid encirclement. “Ni shagu nazad”—Russian for “not one step back”—is often romantically seen as a testament to the dictator’s will to resist the enemy, but is better remembered as Stalin’s refusal to accept the reality of the war. The order led to the senseless slaughter of countless Russians. Entire secret police divisions—complete with their own tanks and artillery—were set aside not to fight the Germans, but to attack and destroy Soviet formations that retreated under Nazi fire. Soviet leaders regarded those captured by the Germans as traitors. Those who had the misfortune of somehow making it back to Soviet territory found themselves put on trial and pressed into service with penal battalions—the so-called Soviet strafbattalion modeled on the Nazi concept of the same name. Officers and men who formed these battalions received substandard equipment and no reinforcements, and were used for suicide missions. In an extreme example recounted by a Soviet defector in the Cold War, men were made to act as machine-gunners in the rear position of combat aircraft—they were chained to their weapons and had no parachutes. Others were deployed en masse to run across minefields to clear them for following armies. Much has been made of Stalin’s cooperation with the Nazi menace, though the full picture might only be gleaned once the Kremlin archives are fully declassified. A common interpretation of events tells us the Soviet dictator was unimpressed with the West’s indecision in the face of Hitler’s pre-war aggression and saw little gain in taking a stand without support from the democracies. Scholars of military history generally agree that the Red Army was severely weakened by communist purges, and was unprepared to wage war when it came. Other research suggests that were it not for the unfortunate timing of the Nazi invasion, the Red Army would have rapidly completed important military reforms and introduced new weapons. Proponents of this view, particularly post-Soviet scholars in Russia, submit that existing Soviet doctrine called for an all-out invasion of Europe at a time of Stalin’s choosing—and that it was for this end, not simple defense, that he extended an olive branch to Berlin. Regardless of what the Soviet leadership hoped to achieve with pro-Nazi diplomacy, the myth of the USSR as an ally of freedom at any point in World War II is ill-founded. One need look no further than the post-war fates of Eastern Europe and Northern Asia. Marauding Soviet troops, initially welcomed as liberators, were allowed and sometimes encouraged by their commanders to loot their host nations and gained an unexaggerated reputation as prolific rapists. Meanwhile, millions of Soviet soldiers and civilians—1.5 million of them repatriated by British authorities—became fresh fodder for the labor camps as Stalin continued his prewar despotism. But the most deleterious and persisting consequence of Soviet “liberation,” both in the East and West, was political. Stalinist regimes, imposed by Moscow, shackled the fledgling nation-states of Eastern Europe for over 40 years. In Asia, the Soviet lightning offensive against Imperial Japanese colonies in China and Korea directly contributed to the unlikely triumph of the local communists. 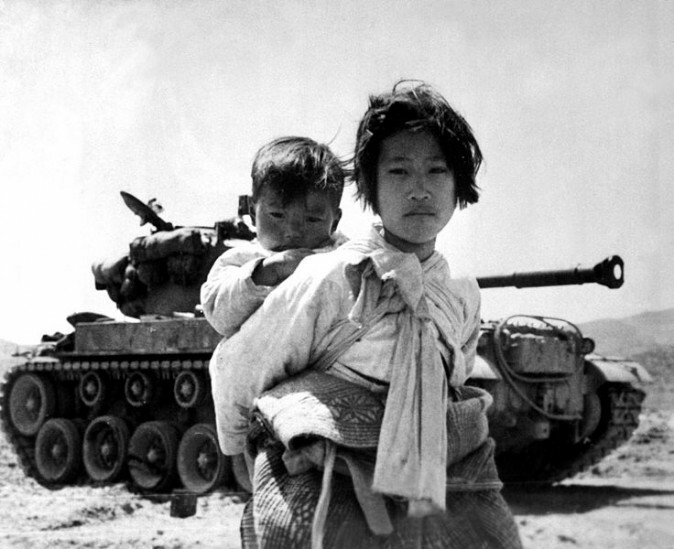 Over 70 years and hundreds of millions of victims later, these regimes are still in power. If that was the case, Germany should have taken legal action against Poland using correct channels. Instead Victor Rothschild duped them into invading Poland in order to bring about war. Why didn’t the Allies (Britiain and France) also declare war on the USSR too. Why only Germany? Well the answer is simple. Soviet Spy Victor Rothschild controlled the UK and all Prime Ministers. He was a double agent and head of MI5/6 from 1935 until 1963 when he was finally caught out, but the UK establishment did everything they could to cover up his actions. Rothschild was responsible for handing Poland to the Soviets after WWII. Surely Rothschild committed War Crimes, surely? Here we are shown a picture of Jews welcoming the communists who mass murdered so many Poles. Yet present day Poles, like those that write articles on this site, constantly defend Jew ‘holocaust’ lies. You seem to have selective hearing and “eyes wide shut”. The war took place and millions of innocent lives gone, jewish too. But the number was greatly exaggerated, which is mentioned in numerous articles. And only the rich jewish lobby profiteers from it, not the real victims. STOP THE CRAP AND GO ELSEWHERE! This entry was posted on September 17, 2018 by HKW in Uncategorized and tagged 17/09/1939, Communism, Darkness of Victory, German and a Soviet alliance, History, USSR, WW2.